This is a 20-pin ZIF sockets (0.3" wide) and is perfect for programming micro-controllers in DIP packages with up to 20 pins, including 8-pin, 16-pin, 18-pin, and 20-pin devices. There's even a little bar to indicate where to put a DIP-8, if you want to use one. Perfect for making DIgital IC Tester project. 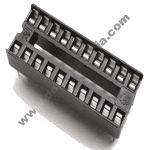 20 PIN IC BASE IC Base or sockets are usually preferred instead of directly s..